"HTML Format Cleaner" adds two context-menu items to the right-click menu over selection context. One context-menu is to clear the text formatting and the other one is to copy the plain text equivalent to the clipboard. The former item can be used when you are editing a formatted text on a WYSIWYG HTML Editor, and the latter one can be used to clean copy a format string to a WYSIWYG HTML Editor. What is the "HTML Format Cleaner" extension? This extension adds two items to the right-click context-menu over selection context which removes HTML formatting like bold, italic, font-size, background and foreground colors. The other item is to copy plain text to the clipboard. 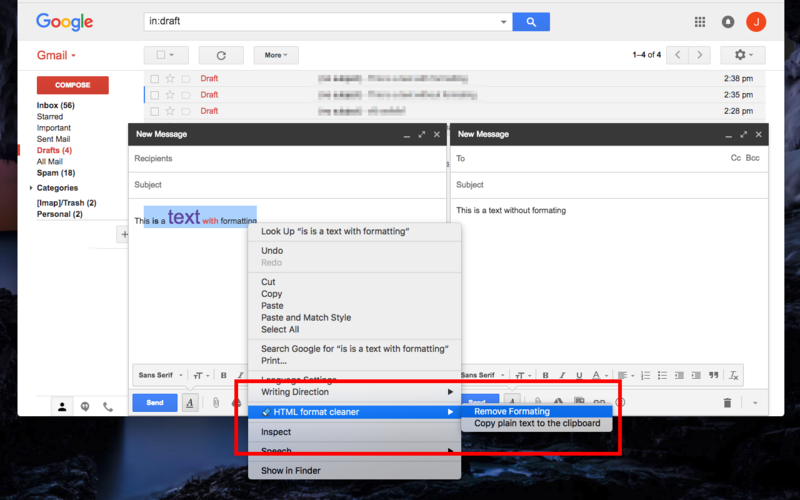 You can use the formatting button while writing on a WYSIWYG HTML Editor when the formatting is messed up and use the other option to copy non-formated textual data to a WYSIWYG HTML Editor. How does the "HTML Format Cleaner" extension remove HTML formating? "HTML Format Cleaner" uses the browser internal toString method to clear any selected HTML tags in the selection range. Then it create a new range element to insert the text-only data to the selection position. This happens after collapsing the current range which means the old HTML data will get truncated. Sometimes after using the format cleaning item, still text has some formatting. How can I completely remove the formating? "HTML Format Cleaner" extension removed the entire formatting of the selected area, but when the non-formated string is paste to the range area, it will get the formatting of the parent node. For instance, if you have a parent element which has a CSS style to color all the child nodes as green, then even after removing just one child's formatting, the color of the child will be green as this color is forced by the parent element. To remove all the formattings, you need to select all the child nodes and then call the format cleaning item.